In case you missed it, click here to check out my last post about keeping your upper body strong in your plank. Often the low back is over-working because the abdominals aren't working as hard as they could. Lift your abdominals away from the ground and toward your spine! Simply aligning your bones will allow the proper muscles to work. If your lumbar spine is extended (or swayed), your low back will take over for the abs. 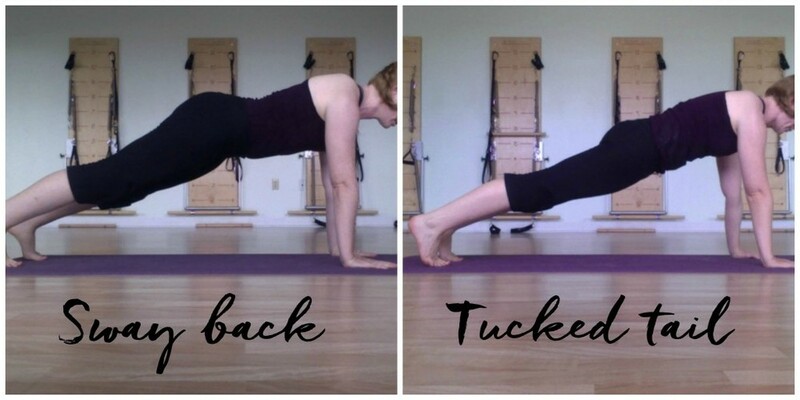 Tuck your tail as in the picture below to keep the work in the front of the body instead of the back. If you go into your plank and your low back fires, often a simple bend of the knees will help you to keep the work in your abs. If you’re new to planking, try keeping your knees on the ground and work on finding a straight line from your knees to the top of the head. When that feels easy, try a plank with bent knees and eventually progress to the full exercise. Let me know your questions and your planking victories in the comments below.